Buhari, Ortom Meet Behind Closed Doors – Royal Times of Nigeria. President Muhammadu Buhari and the governor of Benue State, Samuel Ortom, just concluded a meeting inside the State House, in Abuja. The meeting was held behind closed doors. according to report gathered, Governor Ortom after the meeting with President Buhari told journalists that the attackers are camped in Tunga in Awe local government area of Nasarawa state. He also acknowledged steps taken by the Federal Government in tackling the crisis but said more needs to be done and also gave the account of how the attackers engaged the security personnel stationed in his state killing some and injuring others. 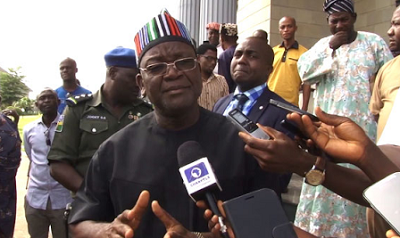 Governor Ortom of Benue State also accused the leadership of Miyetti Allah Kautal Hore, a group of Fulani cattle breeders in the country, for the strings of killings in the state.